In Denmark most of the larger breweries make a 'Classic' which is a Vienna lager. It is one of my favourite styles and I always have a few home as that is what most of my friends or any guests seem to go for when asked if they would like a beer. From the bog standard tuborg classic, which is actually ok if you use the pour from a great height technique ;) to an extremely decent brew like Weltenburger Kloster Anno 1050 which I will put in a blog at a later date along with some other 'Classics'. 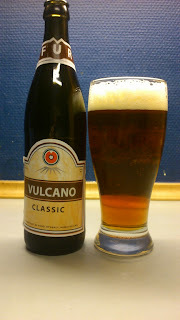 Fur Bryghus has this Vulcano series which costs half of what their normal overpriced range retails for..in my opinion of course. I think it is their made for supermarkets discount line. 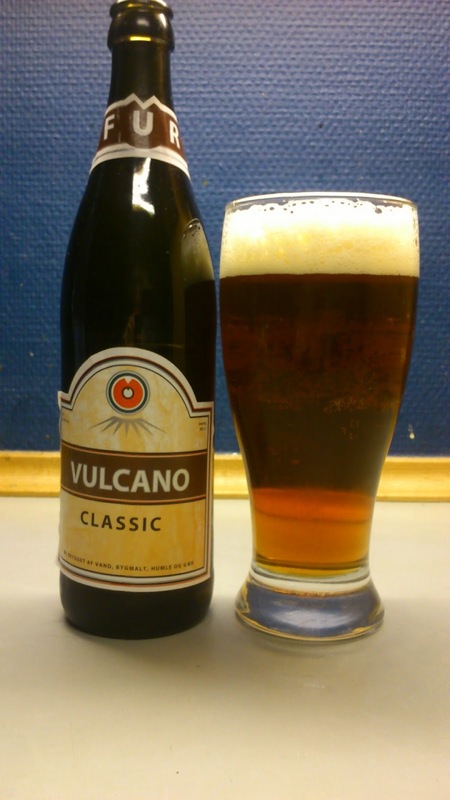 Volcano Classic pours clear dark amber with a small off-white head. Mostly roasted malt, a bit of caramel and some mild hops on the intake while the finish is lightly bitter. Has a burnt toasty aftertaste which is bordering on smokey. I quite like this 'Classic', it is an unoffensive everyday beer that is neither bad nor great, meaning a tiny bit better than the average. Just a beer to drink without thinking about it too much. This scored 5/10 on my 'this means nothing to meeee...oh vienna' Beerometer.